The Egyptian Cat Goddess Bastet. She was patroness of sunshine and warmth and all the good things in life, especially music and dance. She was a protectress of women and children.The cat pendant also has a eye of horus on the shoulder and a cartouche. 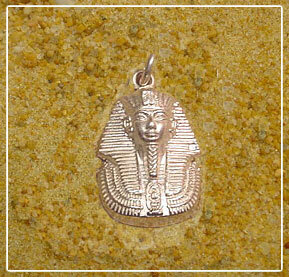 This Egyptian silver pendant measures 1 1/4" X 3/4", including bail. Sacred to all Egyptian Sun Gods, the scarab amulet provided the wearer with both the protection of the Sun & its creative life-force. Silver Chains. Very special Life, Health and Happiness silver Egyptian necklace. The Egyptian necklace includes 20" silver box chain.